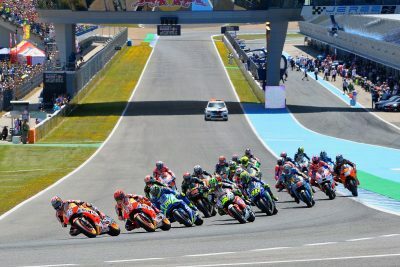 Michelin has completed the fly-away start to the 2018 season and now MotoGP™ heads to its spiritual home as the championship moves to Europe and the first of 11 consecutive events on the continent with the Gran Premio Red Bull de España at Jerez in Spain beginning proceedings this weekend. Michelin’s date with the Circuit de Jerez will also see the French company facing the third track in succession that has had significant work carried out on the surface since last year’s races. This time the 4,423m layout in the Andalusian region of Spain has undergone a complete resurface, but unlike the previous two events in Argentina and America, Michelin has had the chance to assess the data of the teams that have tested at the circuit and is heading to round four with good information as to the track’s properties. With this valuable data the tyre selection for this weekend will feature compounds designed to meet the needs of all riders, teams and machines, and give a thorough choice for all involved. The full range will feature soft, medium and hard MICHELIN Power Slick tyres for the front and rear, with the front all a symmetrical design, whilst the rears will be asymmetric and feature a harder right-hand side to cope with the extra stress that part of the tyre will face from the nine corners which travel in that direction, as opposed to just five left-handers. Should wet weather be a factor at any time during the weekend a range of MICHELIN Power Rain tyres will be available in soft and medium compounds, with the rears being an asymmetric design with a harder right shoulder, the same as the slicks. The opening European event of the year will also signal a very special occasion for Michelin, as race day will see the 400th occasion that the winner of premier class Grand Prix has used Michelin tyres to race to victory. Since joining the two-wheeled Grand Prix championship in 1973, Michelin has taken victory in 73% of the races it has competed in during the open era, with 39 victories – prior to this weekend’s Jerez event – coming since Michelin returned to the championship as the Official MotoGP Class Tyre. The Circuit de Jerez is situated close to the town of Jerez de la Frontera in the sherry producing region of Spain, approximately 90km south of Seville. It has been a regular event on the MotoGP calendar since 1989 and is now the traditional opening European race of the season. Although it is one of four races held in Spain, it is the only one given the title of Spanish Grand Prix and this highly charged event always attracts a huge crowd which fills the hillsides surrounding the track. Michelin will be in action on Friday for two Free Practice sessions, followed by two more sessions on Saturday, alongside qualifying to decide grid positions for Sunday’s race. The main event this season is one of the races that have had a reduction in laps, with only 25 circulations this year, down from 27 in previous seasons. The lights will change to signal go at 14.00hrs local time (13.00hrs BST, 14.00hrs CEST, 12.00hrs UTC) when the riders will begin the battle to see who will be number 400.